See what went on in April 2009- many Great Alne Long-Weekend Events have close similarities from year to year. Nel van der Laan was our 2009 visiting teacher from the Netherlands.. There were technique workshops, followed by Contra Dances for Sat. and Sun. Evenings from Rhodri, culminating in a major lively Contra Dance on the Sunday Eve. Hope you also didn't miss - On the Saturday, Yet more of Cathy's fun dances from the 1940s. Israeli Dances with Adrian Pointon. Is the teacher of Israeli dance par excellence. Gt. Alne Social Dancing in 2009 was on 3 evenings. Fri./Sat./Sun. Visiting when you chose. With 3 bonus late dances too. Hot drinks included in entertainment breaks. On Friday Evening 2009 with Barbara Kinsman & Bill, we had many traditional English Playford-Style Dances, but also International Dances, and Late Nite Extra with Cajun Dance. Yang hopes however to introduce Tai Chi / Kung Fu Fan to Great Alne in 2010. And we will look forward to a stunning evening demonstration from her. or if you wish to contribute activities or ideas, please email a feedback, or ring, or tell André. Monday. 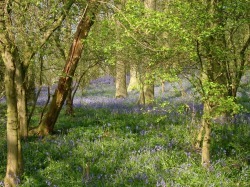 Oversley Wood bluebells: Afternoon walk. Always a joy. Many are able to share the Monday at Gt Alne. A delight: most especially for visitors from The Netherlands. Our caterers at Gt Alne offer several choices for the seated Monday served lunch in the hall. After lunch, we had a gentle dance from Nel. 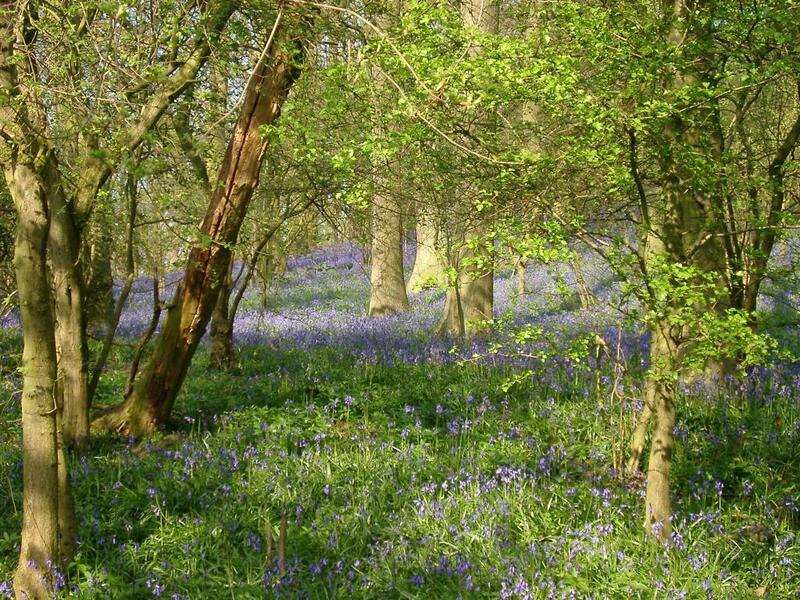 Pic CLICK To enlarge this photo of Oversley Wood Bluebells Copyright James Hobro. PLAN AHEAD NOW to take full advantage in 2011 of this Monday. Historical Dance from Cathy Greenhill we hope to have again. Her Quadrille from the 19th Century - Was Paine's First Set. Interesting to have partaken in this, the origin of several Irish Set Plain Sets that are danced today. On the Saturday, We were treated to more of Cathy's popular dances from the 1940s. Are distributed to promote especially Fri & Sun evenings, which visiting Dancers may particularly enjoy. Amendments necessitate the finalised programme being published not very long before the event. or wish primarily to participate in a particular type of activity. Musicians please note the code on the programme when you are welcome to join those playing.